Linen is made from the fibres of the stem of the flax plant, and belongs to a group of natural cellulose fibres known as bast fibres. Bast fibres are also known as ‘soft’ fibres or skin fibres, and are characterised by their fineness, strength and flexibility, which distinguishes them from the coarser and less flexible fibres of the leaf, or “hard,” fibre group. Linen fibres are obtained from the inner bark (or skin) of a plant. The fibres support the conductive cells of the phloem and provide strength to the stem. The flax plant generally thrives well in very varied climates, but for top quality fibres the environment should be moist but mild. The plants do not require extensive irrigation and can flourish without chemical intervention. Flax is the only commercial cellulosic textile plant indigenous to Western Europe; it is also the strongest of all the vegetable fibres being two to three times stronger than cotton. Linen is grown in Ireland and Northern Europe; from Southern Normandy, France to Belgium and the Netherlands, which together produce 85% of the world’s flax. The longest and more desirable flax fibres are from plants that have been hand harvested; this process entails pulling up the plant complete with root from the ground, as the fibres continue all the way through to the root. The second best option is to cut the plant stalks very close to ground level. Flax is a renewable resource and has the potential to be much more eco friendly than cotton. It requires far less use of pesticides and artificial fertilizers. It grows best under traditional farming methods where the crops are rotated and fields are allowed to lay fallow; it also benefits from a longer lifespan. The environmental impacts associated with water consumption, pollution and build-up of salts in soil are generally limited or avoided. Linen, like other Bast fibres, can thrive well on land unsuitable for food production and may even assist the recultivation of soils previously polluted with contaminants such as heavy metals. With crop rotation farming methods it is not necessary to use chemical fertilisers and pesticides when growing flax. Even when these are used flax requires only one fifth of the pesticides and artificial fertilisers that is required for commercially grown cotton. Organic linen refers to linen that is made from plant fibres where the plants have been grown without the use of toxic pesticides and fertilizers. An additional benefit is the longevity of the fibre; linen is up to twelve times stronger than the equivalent cotton product, which dramatically increases its life span and therefore does not need to be replaced so often. 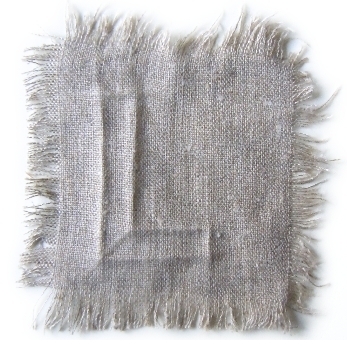 Linen absorbs dye well, especially natural dyes, and does not require chemical treatments. Natural flax colours range from shades of ivory, tan and grey. White or pure white is only achieved through various bleaching processes, but it can be sun bleached to avoid the use of artificial agents. Flax processing is, however labour intensive, and requires skilled workers. But it produces minimum wastage, as there are several by-products; these include linseed oil for linoleum, soap, fuel and cattle feed. Linen is a significantly more expensive fibre than cotton, with more of a sophisticated niche market appeal and therefore is an ideal vehicle for organic cultivation and ecological production methods. If you use this content on your site please link back to this page and credit accordingly.